Glass’s are embracing the digital revolution by launching a new app for their ground-breaking GlassNet Radar tool. 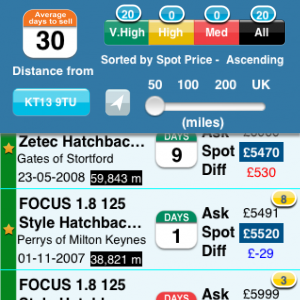 GlassNet Radar is a unique spot pricing tool which allows dealers to know what vehicles are selling for and get asking prices right first time. The app – available on iPad, iPhone and iTouch – is open to any trade customer, with access free to users once a Glass’s subscription is set up. Vik Barodia, Director of Product Management and Marketing at Glass’s, said: “Radar is a tool that allows dealers to outwit their competitors. “It gives them detailed insight into what is really happening in the market. “It allows dealers to compare their own vehicle’s asking prices against their competitors, both locally and nationally, even down to the detail of how long the car has been on the market and how many price changes it’s had. Since Glass’s launched Radar in January 2012, more than 2,000 dealers have signed up. Spot pricing has now been well accepted within the trade, and many businesses around the country are pricing and purchasing stock using GlassNet Radar spot prices. “Alongside dramatic growth in iOS sales and a ten-fold increase in Glass’s customers going digital, the launch of the Radar app is the next logical step,” added Barodia. GlassNet Radar also provides UK-wide intelligence into factors affecting the used car market, such as regional price differences. In addition to web and mobile app, the tool is also available as a widget, fitting in to any system. Over the coming months, Radar technology will become available in conjunction with other Glass’s products.